Tower Bridge is a combined bascule and suspension bridge located in London, United Kingdom. This bridge crosses the River Thames, close to the tower of London. It is one of the finest and most recognizable bridges in the world. This bridge was officially opened on June 30, 1894. For finalizing the design of the bridge, the City of London Corporation held a competition for the design in 1876. More than 50 designs were entered and Horace Jones and John Wolfe Barry’s design was chosen in 1884. It is the only Thames Bridge which can be raised. Tower Bridge is 244 meters long and each tower is 65 meters high. The central span of the bridge can be raised to allow ships to pass. More than 400 workers helped to build the bridge and over 70000 tons of concrete were sunk to the bed of the River Thames during the construction. The total cost of the construction of this bridge was £1,184,000 at that time. The bridge was originally painted a chocolate brown color, in 1977 it was painted red, white and blue for the Queen’s silver Jubilee. At the time of its construction, Tower Bridge was the largest and most sophisticated bascule bridge ever completed. The Tower Bridge Exhibition in 2014 launched its most significant development since 1982 – the glass walkway. More than 40,000 people use this bridge every day. Some people confuse Tower Bridge and London Bridge with each other but they are different crossings. Declan, Tobin. " 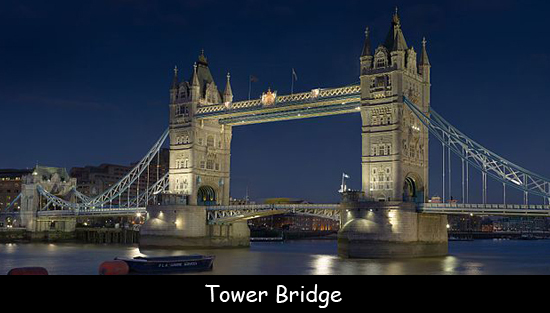 Fun Facts for Kids about Tower Bridge ." Easy Science for Kids, Apr 2019. Web. 21 Apr 2019. < https://easyscienceforkids.com/tower-bridge/ >.